New Video Recording application known as iPhone Video Recorder was launched by DreamCatcher. 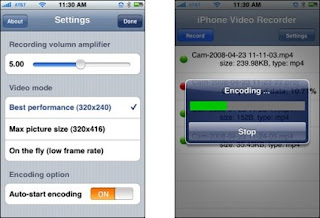 iPhone Video Recorder records audio and video to the compressed mpeg4 format, so the recording is space saving, an-hour-high-quality recording will be a file as small as 60MB. VideoRecorder allows consumers to save video with audio, and is offered in 2 versions. The first trial that lets you record up to 30 seconds to 15fps and obviously the second Full which has no time limit for registration. 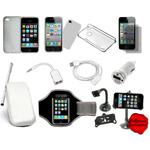 The cost of obtaining the full license is $ 19.95.
iPhone Video Recorder offers new recording method a scheme known as “postponed encoding,” in which video and audio are recorded and stored in your iPhone’s memory in raw format, and then encoded to the iPhone’s standard MP4 format at a time when it is convenient for you. This deferred method allows for the higher frame rates. One nice feature is that since the encoding itself is naturally slow, as you would expect from 412MHz worth of horsepower, they’ve added the ability to stop the encoding at any time and resume it later on. · Playback, send out by email. How to install? Firstly, Open the Installer, add source: http://www.iphone-recorder.com/install2 , browse to the Multimedia category and Install iPhone Video Recorder.